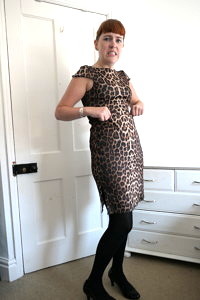 When bad things happen to good fabric – the leopard print dress of doom | More blue fabric? Back before Christmas last year, I went fabric shopping in Dalston. 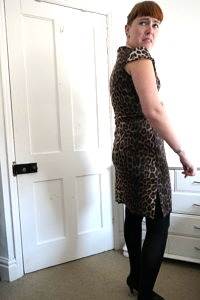 It was all pretty exciting, but most exciting was the discovery of leopard print scuba. 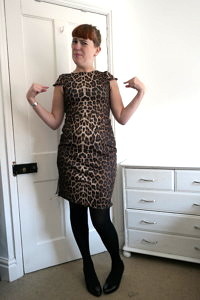 I saw it and in my head popped the perfect image of a leopard print wiggle dress, just the thing to wear for a New Year’s Eve party and, as luck would have it, that month’s Seamwork pattern was indeed a wiggle dress. A match made in heaven I thought. I thought wrong, something that I discovered at 4pm on New Year’s Eve (yes, the same day I had planned to wear it). The fun was only just beginning…. The Seamwork Ida dress: “a flattering, figure-hugging dress that hits just above your knee… [with] a boat-neck neckline, [and] shoulder gussets to keep the neckline in place”. The result of Cruella DeVille and Patsy from Ab Fab vomitting simultaneously. Yes. The pattern placement, which I tried to think about careful has ended up looking weird. There’s gaps either sides of the bodice front which show off my bra. The neckline at the back gapes something rotten – I could genuinely fit a melon down there. As for that roll in the fabric at my stomach, I have no idea what caused it, but I think it might be the least flattering element of the dress. And that’s saying a lot. No. Or rather, not without taking it apart and starting all over. It needs additional fabric adding to the sides of the bust, a whole heap of fabric taking out at the centre back to get rid of that gaping, and I’ve no idea what doing to get rid of the weird roll at my stomach, but I think making it smaller? Maybe? It might also be better if, rather than scuba (hello thick fabric) it was made with a thinner jersey; certainly that might help with the rolling. I’d like to say “don’t decide to make something for New Year’s Eve and not try it on until the day of the party”, but, having realised the horror of this dress, I then went on to make another dress in the three hours I had before I went out. That dress was a lot more successful. Maybe, don’t assume that scuba, although stretchy, will behave like jersey? Don’t make something without toile-ing it first? 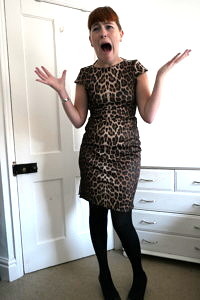 Don’t think that if you make a leopard print wiggle dress you’ll be transformed into a 50s bombshell the minute you put it on? Can we see more pictures of how awful it is? Burn it or turn it (around)? I kept looking at this pattern and worrying about that sleeve and bodice edge, – thank you for confirming my instincts were spot on! You could get rid of the top part and do a high waisted skirt? ?